An unfortunate element in many video games is the presentation of equippable gear for women in a style that makes those items appear inferior to the counterpart items used by men. Sadly, Phantasy Star II does not follow the footsteps of its predecessor, which famously broke from such concepts in the depiction of women in games. 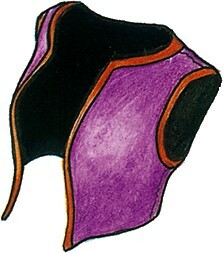 We can see a clear example of that in this manual illustration for the Carbon Vest, a torso protector for the female characters. The male counterpart, the Carbon Suit, has the same defensive statistics - but it is a full jacket, covering everything from waist to neck to wrists. It's a stark difference from the heavy armor and shields Alis used.